Get ready for the summer movie season! Kicking off today, on May 5th with Guardians of the Galaxy Vol. 2, the 2017 summer movie seasons runs through August and features plenty of big blockbusters and franchise sequels to enjoy. 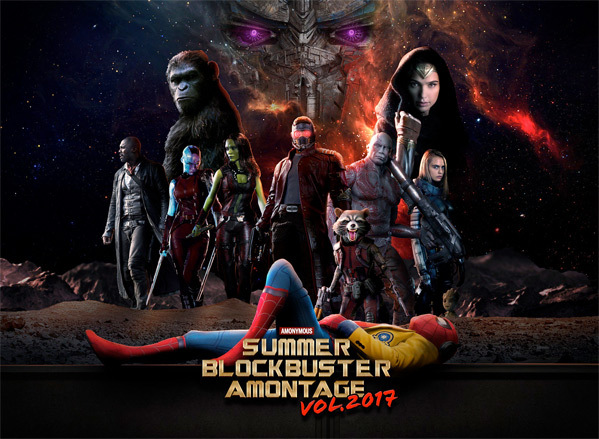 As a preview of what's to come to the big screen this summer, film critic Amon Warmann has put together this video called the "Summer 2017 Blockbuster Montage", or "AMONtage". Featuring footage from over 15 big summer blockbusters, this plays the perfect sizzle reel to put dollar signs in the eyes of studio executives everywhere. Guardians already opens today, with Alien: Covenant, King Arthur, plus Baywatch coming up in a few weeks. Some of our most anticipated movies open in July, including War for the Planet of the Apes, Dunkirk and Valerian. There's plenty to look forward to over these next few months. Description for the video from YouTube: "Get excited for the summer blockbusters of 2017 with the Summer 2017 Blockbuster AMONtage!" This summer movie preview was made by Amon Warmann (follow him on Twitter @awarmann), hence the title "Amontage". This mashup features footage from these 2017 summer movies: Guardians of the Galaxy Vol. 2 (May 5th), War for the Planet of the Apes (July 14th), Transformers: The Last Knight (June 23rd), Valerian and the City of a Thousand Planets (July 21st), Baywatch (May 25th), Spider-Man: Homecoming (July 7th), The Mummy (June 9th), Pirates of the Caribbean: Dead Men Tell No Tales (May 26th), Alien: Covenant (May 19th), Atomic Blonde (July 28th), King Arthur (May 12th), Dunkirk (July 21st), Baby Driver (June 28th), Cars 3 (June 16th), The Dark Tower (August 4th), Wonder Woman (June 2nd). What are you excited about?